It’s a harmless, time-honored expression. You got a problem with that? Saying “Merry Christmas” is a seasonal greeting. 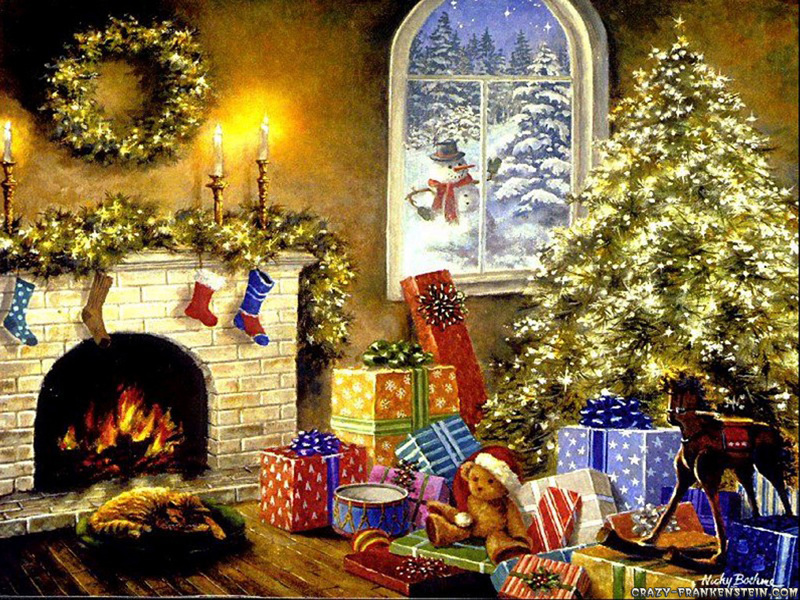 Christmas is, itself, observed in the United States as a traditional holiday—not a religious holiday. That some also link it to the birth of Jesus should be of no real consequence (and they’re probably a few months off, anyway), as it’s been suggested that the arbitrary designation of December 25th to commemorate Jesus’ birth was deliberately intended to coincide with the winter solstice and the Roman festival known as “Saturnalia”. People should be no more offended by hearing “Merry Christmas” than they would be if someone handed them candy and hard-boiled eggs and said “Happy Easter.” And that thing’s called a “Christmas tree”—not a “holiday tree.” Raising a fuss about that just smacks of political correctness taken entirely too far (a rapidly growing –finally!– issue in many areas of concern, by the way.) Does the expression “Yuletide Greetings” offend you? It’s no less “religious” than “Merry Christmas”, inasmuch as “Yule” initially referred to a pagan festival—another of many traditional winter festivals of various names observed in cultures around the world for hundreds (if not thousands) of years. This was back when the argument was first being advanced that we all have an absolute right to never be offended in any way by anything. Kiss that good-bye. No more. I’ve noticed the re-emergence in recent years of the use of traditional greetings by the population at large—even as retailers and businesses seem bent on eradicating their use. Whether this represents a rebellion against the political-correctness movement is uncertain. Whatever it may suggest, I like it. I’ve thought recently about an interesting encounter many years ago in Korea. The remote site the Army had assigned me to was located near a Buddhist temple, and a few of the priests came to call a day or two before Christmas. I found myself engaged in light conversation with one of them, and couldn’t help pointing out to him the irony of the situation (Buddhist priests in Korea joining in the observance of what many GI’s also regard as the day marking Christ’s birth)—which, of course, wasn’t lost on him, either. He noted, though, that while they didn’t regard Jesus the same way that Christians do, they did acknowledge him as a great man whose teachings were nonetheless compatible with many of their own beliefs; besides, the priests viewed us as visitors in their land, and maintained that they would be poor hosts if they didn’t at least note the occasion. Moreover, he emphasized the universal “peace on Earth, goodwill toward men” view as the central theme for the holiday, anyway—which resonated well with their own beliefs. And he had no qualms whatsoever about bidding me a warm “Merry Christmas” when we finally parted company. Sorry, but I don’t see anything offensive about Santa Claus, Jingle Bells, or reading ‘Twas the Night Before Christmas to kids. If the strains of Nat “King” Cole crooning about chestnuts roasting over an open fire offends you, you have a problem. While I don’t buy into the “He’s the reason for the season” and “Keep Christ in Christmas” arguments, I don’t find such missives offensive, either; each to his own. As noted above, Christmas is a traditional holiday, and I leave it to each individual to take from it what he or she may. I have no feeling about Nativity scenes one way or the other; as far as I’m concerned, if people want to have them, they’re welcome to it. Regardless of one’s religious beliefs, the argument could be made that the presence of such displays is likewise traditional. While I’m more partial to Here We Come a-Wassailing, I’ll freely confess that hearing Carol of the Bells also carries a certain significance. Probably the last place anyone would expect to find me this time of year is a church—yet I’ll also admit that passing by a church alive with a choir singing familiar carols also puts me in the holiday mood; whether one embraces similar beliefs is irrelevant. Again, it’s up to each of us to take from all this what we will. He’d been about to climb into the cab of his yard tractor, but stopped and grasped my hand firmly. “Merry Christmas, driver. Be safe out there.” The firmness of his handshake, his eyes, and his voice all revealed an unmistakable sincerity. At such moments, I find that I’m suddenly no longer quite so cold or tired or hungry. In fact, I feel pretty damned good. So do most others, I suspect. And with that, I freely, happily, and unapologetically bid you all a Merry Christmas. Like many, I’ve been giving a lot of thought to Reverend Terry Jones’ planned demonstration featuring the burning of Korans. Having considered it at length, I’ve reached one conclusion: I have mixed feelings about it—and this ambivalence will never be resolved. On the one hand, I fall back on the default of freedom of religion and worship, and I cringe at the prospect of book-burning. It’s easy to understand how some would equate such an act to the Nazis’ heinous and destructive campaign against Jews. It’s easy to understand concerns that such a spectacle might focus hatred on a group based on their beliefs. It’s easy to understand why military commanders express concerns that our forces stationed in the Muslim world might be exposed to danger as Muslims’ ire is inflamed. It’s easy to understand why so many have felt compelled to distance themselves from the planned event, and to add their voices to the widespread condemnation of Rev. Jones. If one chooses to burn a U.S. flag, it’s considered “freedom of expression”—and likely to attract protection from legions of civil-rights attorneys. If a band of lunatics disrupts funeral services for a fallen soldier, the court not only affirms their right to do so, but requires the soldier’s family to pay the legal costs incurred by the loonies in defending that right. And where was the compulsion for widespread condemnation when Palestinians took to the streets in celebration even as the twin towers of the World Trade Center were still falling? 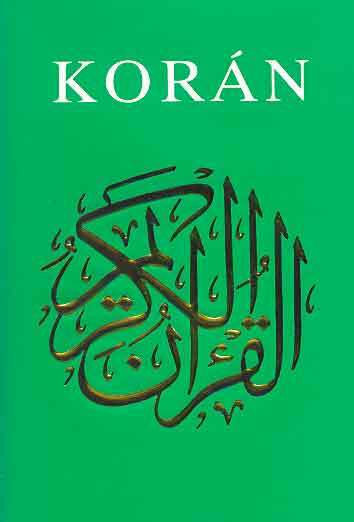 Indeed, soldiers assigned to the detention center in Guantanamo have been criticized for allegedly (no proof emerged) showing some measure of disrespect for the Koran (those allegations having been made, by the way, by detainees who routinely hurl their urine and feces at the staff). More recently, we’ve been bombarded with angry denunciations by Muslims for newspaper cartoons in Europe that were seen as criticisms of Islam. Still fresh is the memory of the brouhaha that resulted when the Comedy Central channel capitulated to Muslim demands over a South Park episode making fun of Mohammed. It’s clear that a dangerous precedent has been set—and it’s being perpetuated. It seems that anything that might by any stretch of the imagination be misinterpreted by a Muslim as offensive draws criticism. It appears, in fact, to be the latest manifestation of censorship that began during the days of civil rights marches, when whites suddenly became aware of the need to choose every word very carefully just to avoid even the appearance of racism. It’s had the practical effect of creating an environment wherein Muslims anywhere in the world can now dictate behavior by whim—merely by suggesting that some unrest might result if we don’t take heed. It is at its base a strategy intended to spread fear and force acceptance—and it’s working. Moreover, each case that sees someone appear to back-down in the face of such charges serves both to progressively embolden radical Muslim elements and to bolster the validity of their approach. At this point, we might stop asking what may happen if Rev. Jones goes through with his planned Koran-burning event—and ask instead what may result if he doesn’t. 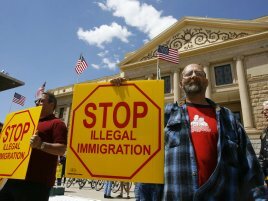 One scarcely knows where to begin in trying to keep abreast of events unfolding in the ongoing and escalating controversy over Arizona’s recently-enacted immigration law. What began as a desperation-driven attempt by the state of Arizona to plug the gaps created by federal negligence spawned a groundswell of public outcry and political posturing on both sides of the Mexican border. …and—as predicted—Barack Hussein Obama and his henchmen responded with alacrity to the opportunity for extracting political gain from the situation (that “never let a good crisis go to waste” philosophy); indeed, one might wish that they’d shown as much enthusiasm in warding-off the current state of affairs. Demonstrations and boycotts ensued, with the state of Arizona (and the 84% of its voters who favor the state’s initiative) being pressured to abandon the effort. And, of course, Mexican President Felipe Calderón appeared before a joint session of Congress to denounce the Arizona law, lecture us in the niceties of border protocol, and tell us that we need to ban assault weapons—for which congressional Democrats awarded him a standing ovation. The reader will at this point kindly choke-down the bile that may be felt rising within. Enough, already. This is not rocket science. It isn’t brain surgery. While purported to be a complex problem, the matter of illegal aliens is in fact a very simple one—and it has relatively simple solutions. This has gone on far too long. The Federal government—from the White House to Congress to the responsible agencies involved—all of them need to get off their dead butts and simply do their job. 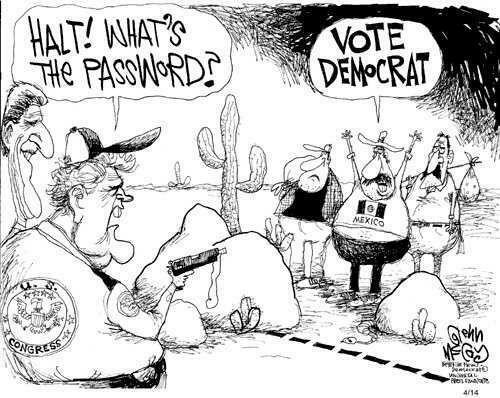 Quit playing politics and pandering for votes; secure the border—as required by the Constitution. 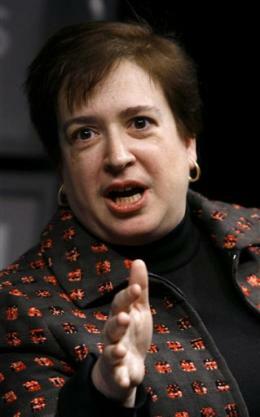 Elena Kagan: Is she—or isn’t she? uh…what was the question, again? It’s said that revenge is a dish best served cold. Irony, on the other hand, is delicious any time—and we should take time to thank those in Washington who keep us well-fed. Take, for example, the latest nominee for the Supreme Court. Serving-up Elena Kagan as his latest hors d’œuvre, Barack Obama has once again replenished the buffet. In a somewhat questionable move, Obama purposefully sought-out a candidate with no judicial background. While this approach is not in and of itself without precedent (nor logic), it does invite some skepticism—particularly with the memory still fresh of George W. Bush’s ill-fated nomination of Harriet Miers. Naturally, Kagan’s supporters hastily moved to discount comparisons to Miers—with some validity. While there are similarities between the two candidates, there are also some differences; yet to be determined, of course, is the extent that one may be distinguished from the other. The salient issue accompanying the nomination of any non-judge is the lack of a “paper trail”—a history of rulings, decisions, and opinions by which a nominee’s legal and judicial philosophy might be revealed. While neither Miers or Kagan ever served as a judge, Kagan’s career has differed in being essentially confined to politics and academia (notwithstanding a short-lived foray into private practice about which we know nothing)—and her supporters would have us believe that there exist sufficient intellectual and academic works to shed light on her views. Now, at this point, it should be noted that Kagan will almost certainly be confirmed. It’s a matter of simple arithmetic; Democrats hold more seats than do Republicans, and there doesn’t appear to be any enthusiasm for a filibuster. Absent a gaffe of historic proportions, she’ll get the job. …and at this point, a question is posed to the reader: Upon seeing the title of this piece, what did you think it’d be about? You might have wondered: Is she or isn’t she what? A liberal? A conservative? A socialist? Or you might have mused: Is she or isn’t she what? A lesbian? And so we arrive at one of two points this piece is intended to advance: We know virtually nothing about this woman. And the long history of academic works alluded to by her supporters? Well, it simply isn’t there. Indeed, after leaving a previous post in the Clinton administration, she was denied re-entry to her tenured position at the University of Chicago owing to the paucity of her works—and her original tenure was bestowed despite objections that she simply hadn’t published enough, even then. She is a tangled collection of contradictions and blank pages—and little else. The obvious drawback to nominating a candidate with such a blank slate is that it arouses suspicion—particularly when that appointment is made by a White House with the track record that Obama’s has, with its rogue’s gallery of tax cheats, socialists, incompetents, and thugs named to key posts. Even Kagan’s supporters have trouble grappling with her true leanings—regardless of the issue. Liberals complain that she’s too conservative (big surprise, there), while conservatives point out her apparent hostility toward the military and embracing of homosexual-rights issues as evidence of her liberal stance. Her advice to then-President Bill Clinton to not endorse late-term abortions is cited as evidence of her relative conservatism. How naive. She made that recommendation only to preserve a political compromise; failure to have done so would’ve risked that compromise being supplanted by a much more conservative (and likely veto-proof) measure being forced by Republicans in Congress. That she eventually allowed military recruiters back on campus at Harvard (she herself ejected them, citing the military’s “Don’t ask, don’t tell” policy) is offered in response to accusations that she’s hostile toward the armed forces; this claim ignores the fact that she “let” them come back only after being forced to do so by a Supreme Court decision—and that she encouraged student protests even while she was opening the doors to the recruiters. And now to return to my favorite point of this missive: that delicious irony. Let’s face it: This Kagan episode is rich with it. Personally, I’m reveling in it. Consider, for example, the quandary facing (or that should be facing) Sen. Patrick Leahy (D-VT), who loudly lamented the lack of a paper trail for Harriet Miers (read: There’s no record to attack.) . Kagan’s tabula rasa, on the other hand, he finds much less disturbing. Go figure. More irony: Concealing so much about Kagan in an effort to preempt criticism actually led to more criticism as people filled in the blanks. Think about Obama’s position. He’s being assailed by his leftist supporters for not being liberal enough (as if ); at the same time, conservatives are unlikely to embrace anyone liberal enough to suit him. True to form, then, he seeks out someone he thinks will be liberal enough to meet his standards and mollify the left, but about whom no one really knows anything for certain—fueling further speculation from the right. And this speculation cannot be decisively addressed for want of the very paper trail that Obama sought to avoid in the first place (Oh, what a tangled web we weave…). With apologies to masculine-appearing women everywhere, one cannot help but wonder about Kagan; sorry, but this broad reminds one of a knock-down version of Rosie O’Donnell—or perhaps leads one to believe that the Washington Redskins have lost track of one of their linebackers. Not surprisingly, it was soon revealed that there have long been rumors that she’s a lesbian. The White House quickly issued a denial—but it hasn’t gone unnoticed that there now seems to be a mission underway to make her appear more feminine. And as if by magic, friends of Kagan began cropping-up in the press to also deny those rumors. …which led to yet another ironic predicament for Obamazoids. Sadly, while this unfolding drama provides grand political theater, it’d be easy to overlook Kagan’s potential influence over future Supreme Court decisions; given her relative youth, it’s not unreasonable to anticipate her hanging-on for thirty years or more. Therefore, it would seem to be of heightened importance that she be thoroughly vetted in her confirmation process—a practice she herself once advocated in one of her few published works; unfortunately, preliminary suggestions indicate that her reception in the Senate will more likely involve velvet gloves than boxing gloves. (It should be noted also that during her own confirmation hearing for her current post of Solicitor General, she seemed much less enthusiastic about such an approach. Surprised?) Again, barring a major faux pas like stumbling over her strap-on while entering the Senate Judiciary Committee hearing room, she’s a virtual lock. And we know practically nothing about her. To paraphrase Pelosi’s asinine health care takeover argument (“We have to pass the bill so that you can find out what’s in it…”), it appears that Kagan will be confirmed with little more than perfunctory examination—and then we find out what we’re getting. Yet another mysterious pig in a poke foisted upon us by the Obama regime. …and just how “open” are all those other borders, anyway? Not surprisingly, the shrill shrieks of the left reached a deafening crescendo—and the left-leaning media were only too happy to chime in. And Democrats continually chumming for the Hispanic vote, of course, weren’t about to miss out on the opportunity to do some timely pandering—with the added bonus of bashing a Republican-dominated legislature and a Republican governor. Worthy of note, however, was the response south of the border. In an ironic role-reversal, the Mexican government issued an advisory discouraging its citizens — including those with the intent of crossing the border illegally — from traveling to Arizona. (Kindly refrain from observing that it did so several decades late and for the wrong reasons.) More significantly, President Felipe Calderón — a noted open border-kinda guy — vowed to protect Mexicans wherever they may be and cited the usual human rights issues, condemning the Arizona law for its potential to foster “intolerance, hate, discrimination, and abuse in law enforcement.” He added that “My government cannot and will not remain indifferent when these kinds of policies go against human rights.” Apparently, our neighbors to the south consider events to their north to be unfairly targeting their citizens—and they seem to think the U.S. should be more like Mexico in addressing such matters. Well. This clearly calls for a closer examination of conditions within Calderón’s bastion of human rights. Meanwhile, Amnesty International has compiled some very damning human-rights statistics regarding Mexico. During one recent six-month period, their records show that nearly 10,000 immigrants were kidnapped, and almost half the victims interviewed implicated Mexican authorities. According to one spokesperson, “Public officials turn a blind eye, or even play an active part in kidnappings, rapes and murders.” It’s estimated that 60% of migrant women fall victim to sexual violence while in Mexico. Let’s hope not; the Mexico that actually lies within Mexican borders is quite hellish enough. Moreover, Calderón appears to be asserting a degree of extraterritoriality that claims exemption of Mexican nationals from the laws of sovereign nations in which they reside—legally or otherwise; conversely, non-citizens in Mexico have no rights under Mexican law. In the broader scheme of things, one might consider similar border situations across the globe. Is this “open borders” demand common elsewhere? Are we xenophobic, right-wing, racist Yankees out-of-step with the rest of the world? Hardly. Notwithstanding the clamor of activists and news-media distortions, even the most superficial of investigations reveal broad employment of restrictive immigration law, the erection of physical barriers, and mass deportations throughout the world. In many countries, illegal entry is a crime dealt with swiftly and severely. Few nations seem to be encouraging immigration—and most resist it. (Argentina does encourage legal immigration from European nations.) Brazil last year enacted an amnesty measure—but largely because its immigration system was completely overwhelmed; it was to no small degree a capitulation on the government’s part and an implicit admission of failure. The European Union, on the other hand, recently implemented a tough, standardized system under which violators are detained for eighteen months—then deported. Clearly, the histrionics of recent weeks do not accurately depict reality. It cannot be overstated that one of the most crucial of the fundamental responsibilities of any sovereign nation is to provide for the security of its citizens—and meeting this responsibility begins with securing its own borders. The failure of the U.S. government to adequately attend this task is manifest. It must be remembered that the issue of aliens entering the country illegally is not strictly an economic issue; rather, it is first and foremost a legitimate national security concern. At a time when many assert that “playing the race card” has been done to death, it was the first straw grasped by Arizona’s critics. Such vilification continued with comparisons to Nazis (always a crowd-pleaser among the socialist-leaning left) and utterly ludicrous charges of government-sanctioned separation of family members. Seemingly ignored (or simply brushed aside) by these same detractors is the clear support of the people — both within Arizona and nationwide — for tougher enforcement of immigration laws. 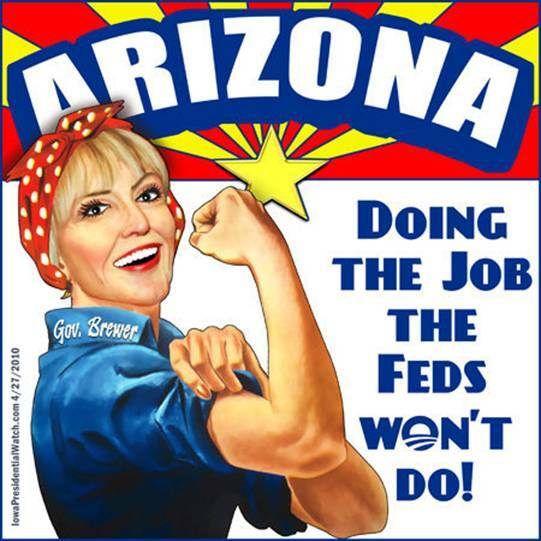 Far from being the run amok-action portrayed by critics of a rogue state government running roughshod over civil rights, Arizona lawmakers correctly identified both the will of the people and the chronic failure of the federal government to discharge its duties, then acted very much in accordance with universal norms—though this would be difficult to discern from the media coverage that resulted. “You lose,” replied Coolidge, as he turned and walked away. They didn’t call him “Silent Cal” for nothing. This vignette is presented in stark contrast to Barack Obama’s seventeen-minute televised response to a simple tax question that could practically have been satisfied with an equally simple “yes” or “no.” Indeed, no one in recent memory is so adept as Obama at transforming a ten-second response into a speech of indeterminate length addressing a topic totally unrelated to the question presented. (Bret Baier of Fox News was recently excoriated by the left for vainly attempting to compel him to remain on-topic and furnish something resembling a straight answer—though he was probably destined to be excoriated, anyway, because…well, just because; such is the level of adoration showered upon The Anointed One by the “mainstream” media.) Having now endured countless Obama appearances spanning seemingly endless hours of empty talk, many who at the time ridiculed Bill Clinton’s then-legendary marathon speechifying now yearn wistfully for his relative brevity. 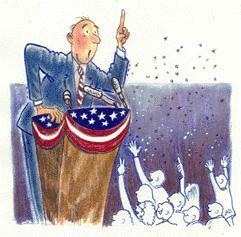 For politicians to exhibit galling degrees of verbosity and posturing is neither unusual nor even particularly new — there is a rich history of renowned orators and speeches immortalized for posterity — though Obama’s rather extreme performances are a little surprising, given the established trend toward parceling information in neat little sound bites. The practice is likely a by-product of avoiding taking firm stands on delicate issues or being tied to specific data; speaking in euphemisms, vague generalities and ambiguous terms lays the groundwork for later claims of “plausible deniability” and even outright reversals of policy should the need arise. Nor is this wordiness confined to oration; need we be reminded of the recent epic-length health care legislation? In general, we prefer that matters be kept more brief. Most of us lose interest in a speech the length of the State of the Union address after only a few minutes and a smattering of insincere standing ovations. We’re even less likely to read the entire health-care bill than Congress is (any bets on how many representatives still haven’t read it?). How many people have never read an entire installment contract when making a major purchase? We know we should—but most consumers simply don’t have the patience and self-discipline to choke the whole thing down (and are quickly befuddled by legalese, anyway). Even those same congressional representatives who are so practiced at wasting our time have established time-allotment rules regarding their own guests; office visits are uniformly short and sweet—and lobbyists long ago perfected the art of maximizing this “face time.” Apart from our severely-strained attention spans, we grow (rightly) suspicious when confronted with protracted speeches or documents of daunting length; more often than not, the speeches are intended not to inform or explain, but to sell—and book-length legislation typically conceals as much as it reveals. Charles Krauthammer wryly noted that the aforementioned Obama soliloquy was many times longer even than Abraham Lincoln’s Gettysburg Address—and said far less. While Lincoln was himself noted for his own lengthy speeches, one might surmise that he was under the influence of Robert Browning’s immortal missive that day, adopting the “less is more” approach. Indeed (contrary to popular belief), Lincoln was not the keynote speaker at the dedication of what was then known as the Soldiers’ National Cemetery at Gettysburg; noted orator Edward Everett was. Everett’s presentation had lasted a full two hours when Lincoln finally rose to deliver what was listed in the program as “Dedicatory Remarks”—and stepped into history. Ah, the beauty of brevity. We have our favorite eloquent speakers and writers who delight us with elegant prose; what we need now is a crop of public figures who get to the point, give straight answers, and know when to shut the hell up. At a press conference amid growing economic concern, a reporter asked Coolidge for his thoughts regarding the inflationary trend that was then insinuating itself into the financial picture. The following day, the public outcry over the “inhumane” character of the fence (which, it should be remembered, was intended to protect a national border) became so intense that the contract was cancelled, and a study was commissioned to determine a more suitable solution; it was not explained how a fence — an inanimate object expressly designed to be an obstacle — could take on human characteristics, nor how anyone would be harmed who wasn’t already breaking the law in the first place since fences aren’t known for reaching out and attacking people. It should be noted that the preceding events occurred in 1969. It can thus be concluded that illegal immigration is neither a new problem nor one likely to go away anytime soon. 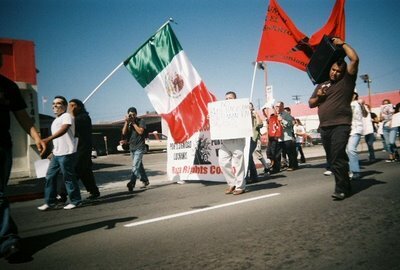 In the present day, we have a President advocating a “guest worker” program (not, he claims, a form of amnesty—though one congressional aide describes the proposal as “the same old pig with new lipstick”), two (thus far) counter-proposals from Congress, and a citizenry becoming more vocal in their demands for immigration reform. All except the citizenry seem to miss the most important point: not one action by Congress or the President — nor any of their respective proposals — offers any real hope of improving border security. While we’re frequently reminded that we’re “at war,” our political leaders seem to have little interest in prudently locking the back door to dissuade intruders. The reason? They’re wary of antagonizing a growing Hispanic voter base. We’re told that illegal immigrants are merely trying to edge into the U.S. labor market to improve their standard of living by taking jobs no one else wants. One can hardly blame them; even the lowest-paying jobs available are generally an improvement over what they leave behind south of the border. However, U.S. citizens displaced by illegal workers willing to accept lower pay (take the building trades, for example) might disagree with the aphorism that no one else wanted the job. Moreover, economic principles assert that the inability to fill a position suggests that inadequate compensation is being offered. Importing cheap labor isn’t the answer; increasing wages to attract applicants is. Most importantly, we should not accept any “reform” that fails to secure the border. Ironically, it seems to have been forgotten that illegal immigrants are by definition law-breakers; they broke the law to get here, and continue to do so by staying. Should we now reward them? And the border remains a virtual open door. The preceding is a reprint, a piece I wrote for The Huntsville Times, Huntsville, AL. It was published on April 2, 2006. To paraphrase Shakespeare: Amnesty by any other name would smell as rotten. * It’s a border, stupid. * Crossing a border illegally is a crime. * Immigration law doesn’t need reform—comprehensive or otherwise; it needs enforcement. 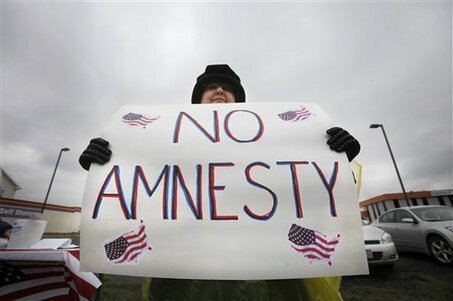 * Granting amnesty in any form is a proven loser—and suggests that lawmakers have badly misread the mood of the nation. What is it about such simple concepts that prove so incomprehensible to this august body of legislators and (to a large extent) lawyers? A motley gallery of Senate negotiators has finally produced some sort of agreement for comprehensive immigration reform. What details lie buried in the agreement (cramming a matter so essentially simple into 350 pages makes the deal immediately suspect; this is Congress, after all) has not yet been revealed. All that’s clear at this point is that everyone involved in these negotiations is pretty much equally displeased with the outcome; two of the key players washed their hands of the mess before negotiations were concluded and the remaining hopefuls don’t seem enthused about the bill’s prospect for adoption. We’re told that the measure’s concept for dealing with the estimated 12 million illegal aliens already here (the government doesn’t know how many there are, characterizing them as “invisible”) isn’t really amnesty, and that it provides for fines, waiting periods, tracking of immigrants (the government doesn’t know where these invisible people are, either), and appropriate provisions for returning them to their country of origin. Add to this mix a president intent on scoring a domestic policy home run, the political fortunes being staked by various congressional members and the upcoming elections—in a town where deal-making is part of the process. Such an intricately contrived house of cards is not likely to survive the forthcoming congressional battle; meanwhile, the root problems remain with no remedies in place, and they’ll still be there should the measure be defeated—at which point Congress will start all over again with nothing gained from months of negotiations. And all those invisible people will still be out there—illegally. It’s time for the government to do the job it’s avoided for decades: secure the borders and enforce the law. Forget “comprehensive” anything until we have a handle on the situation; then will be the time to consider changes. Now, I included the two segments above for the sole purpose of prefacing today’s lesson, to wit: Nothing’s essentially changed. How reassuring. Given Obama’s deft handling of health care reform, I know I’m confident that his next attempt at comprehensive reform and overhaul of yet another system about which he knows next to nothing will be a breeze. Make that a big breeze. A really big breeze. Like a tornado. Make that an F5 tornado. I was asked a few questions in conjunction with comments attached to the preceding posting. The first was whether I was “saying there is no man-made global warming dooming this planet?”…the second speculated as to whether I believed that “global warming was just a ruse?”…and the third solicited my opinion of Al Gore’s role in the climate change controversy. I’ll take a shot at them all with this new posting. There’s more than enough irrefutable evidence that global warming — and cooling — have occurred at various times over a period of millions of years. Some changes appear to be attributable to specific events (e.g., volcanic eruptions and asteroid impacts that caused occlusive dust and ash clouds dense enough to block the sun’s rays), while others have yet to be explained—although a number of theories have been advanced, and some appear to be plausible. As to whether we’re currently experiencing a warming trend…well, that’s another matter. Over a period of several years, I came to essentially accept — with some reservations, owing to persistent indications to the contrary — that we were; however, recent revelations have prompted me (and many others) to question that position. With the discovery of previously unknown climatological data, doubt has been cast. I consider it an unsettled issue—and very much open to debate. The question then arises: Notwithstanding volcanoes and asteroids, is all other climate change caused by humans? However, I suspect that the primary thrust of my initial posting was overlooked, anyway. I shall now endeavor to clarify. Indications of global warming are troubling—but no more troubling than the behavior of many prominent scientists. 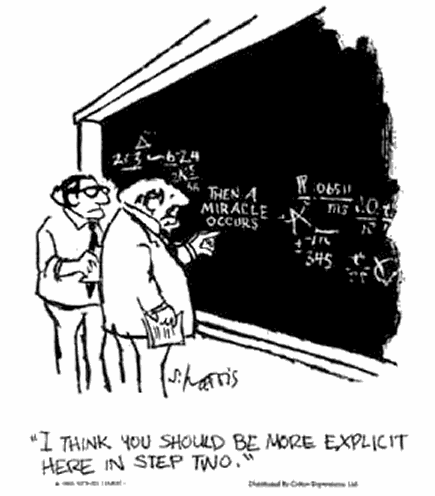 When presented with credible climatological data calling into question their growing acceptance of claims related to climate change (read: “apparent contradictions”), such data deserved their careful scrutiny; instead, they responded with a concerted effort to stifle dissenting voices and dismiss out-of-hand even the mere suggestion that their precious theories just might be wrong. Their only lament? That the revelation of such contradictions might lead to a loss of credibility among the general public (thus far the only claim that’s been proven correct), as revealed in the University of East Anglia e-mail scandal. I’ve not suggested that assertions of climate change are without merit; to the contrary, I consider it a serious matter that warrants careful examination and research—examination and research that won’t be accomplished if a substantial percentage of the scientific community (that’s the folks who should be doing the examining and researching) insist on wearing blinders and smothering valid skepticism of as-yet unproven claims. Yes, some glaciers are melting—but they’ve also melted in the past. Yes, ocean current temperatures suggest external causes—but no definitive evidence has yet been presented. No, I don’t consider the snow on my driveway (in Alabama) an indication that we’re actually experiencing global cooling; some computer models developed to support claims of global warming actually predict such phenomena—and it’s snowed here before, anyway. Yes, I believe that we experience global warming…and cooling—but I remain unconvinced that such conditions aren’t cyclic; it follows, then, that I’d be uncertain whether mankind causes such fluctuations, either—a healthy skepticism shared by scientists and researchers who are a hell of a lot more qualified than I am to voice dissent. Do I believe that “global warming was just a ruse?” Not necessarily. As I indicated, there’s sufficient evidence to warrant further study; the true gravity of the situation, however, I consider debatable. One must consider the stakes involved. Might a researcher be inclined to accentuate one finding over another in an effort to obtain (or hang onto) a lucrative research grant? Might a financier with extensive investments in “green” technology apply pressure to privately-funded research groups in an effort to produce findings favorable to those investments? Is it conceivable that a political figure might beat the drum for “green” legislation knowing the power that will be vested in the overseers of such changes? Vast (and I mean really vast) sums of money and almost unimaginable power and influence hang in the balance. For the foreseeable future, he who controls the “green” agenda stands to hold sway over areas as diverse as government, manufacturing, finance, commerce,—… The list goes on and on—both domestically and (even more so) on the global stage. Al Gore? An opportunist—and a very hypocritical one, at that (he wants me to lighten my “carbon footprint?” Take a look at his.). He’s shown that he’s not as knowledgeable as he’d have us believe. And he’s reputed to have accumulated an almost embarrassing level of wealth during his little crusade. Still, it’s possible that he’s sincere in what he espouses—though I’m much more inclined to view him as simply a well-compensated mouthpiece…and maybe even a mere stooge. In summary, there’s surprisingly little about climate change or its suspected causes that we know for certain. I’ll reiterate my contention that responsibility for the lack of reliable information rests with the scientists who have allowed extraneous influences to get in the way of good science.